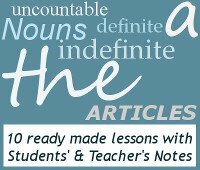 Are you interested in 10 ready made lessons about uncountable nouns, indefinite and definite articles with Students' and Teacher's Notes? I don’t have much luggage. a piece of, a bit of, a bowl of, a cup of, a drop of, a game of etc. All I need is a drop of water. Please can I have two cups of coffee. Shall we play a game of tennis? I love that piece of music. 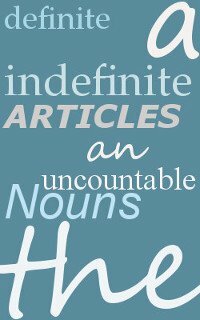 Uncountable nouns normally take the verb in the singular. Travel in Europe is very expensive. The money wasn’t used properly. Some words can be either countable or uncountable, depending on how you use them. There are still two rooms available in the hotel. There’s not enough light here to take good photographs. If you buy a dog, be prepared to clean up a lot of hair. She never has a hair out of place. If you want to print out your thesis, make sure you have enough paper. Gymnastics requires a lot of time and energy to learn. AIDS is most prevalent in third world counties. Acoustics is the study of sound. Some nouns refer to a group of people, animals or things. These nouns can normally take a singular OR plural verb, depending on whether we view the group as a single entity, or as several individuals together. My family is the best in the world. The crew have done a good job. The crew is celebrating the victory tonight. My tights have a ladder in them! My trainers need a clean. To differentiate how many we are talking about, we can use, ‘a pair of’, ‘two pairs of’, etc. I only have two pairs of jeans, and they are both dirty. I’ve bought a pair of black trousers. Gymnastics _____ my favourite sport to watch. I need a new _________ sunglasses, I’ve lost mine. AIDS ______ such a destructive disease. The government _________ planning to change the tax laws. Applied mathematics _____ so complicated. The herd of cattle __________ moving to the other hill. Measles ______ very uncommon now. Don’t forget to take a ____________ pyjamas with you. That gang ____________ vandalized our building again. Here are some quotes about various emotions. Write them onto flash cards and place them face down on the table. The students have to choose one. Without telling the others what their quote is, they need to speak for two minutes on the subject of the quote, either expressing the same opinion as the quote (but in their own words), or the opposite opinion. Give them a minute or two to prepare. Write the following words onto flashcards. Get the students to ask each other questions using these words. The above grammar presentation and activities are an extract from my e-notes on Definite and Indefinite Articles. I have written 10 step-by-step ready to teach and ready formatted lessons, with lots of fun writing and speaking activities for your students to practice. Find out more. My e-notes only cost $3.99, and include everything you need to effectively teach your students how to use English articles.